Service dogs receive up to two years of training, which can cost more than $40,000. Before they are placed, their new owners are often required to live at the training center for a week or two to learn about caring and interacting with their dogs. 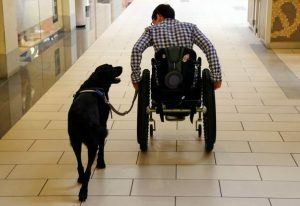 Many training centers provide the dogs free of charge to their clients with disabilities, defraying their costs through fundraising. The waiting time for a service dog is often two years or longer. The article doesn’t seem to list the 19 states. Mine is a question,not a comment. Do service dogs have to have an identifying vest on, so we the public know thats it’s a service dog. there is an 80 lb pittbull in my apartment building (the breed is now allowed in the complex ) and ran at me one day. I complained to management and they told me that they had to let the dog in because it is a service dog.). My question is dont they have to have an identifying vest on them. And after reading your website, it doesnt sound like a trained dog.